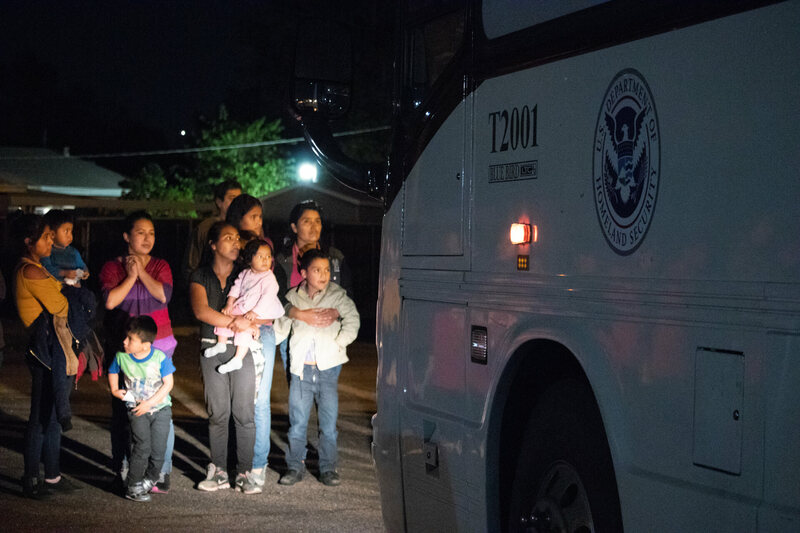 Between March 5 and April 8 – a span of 34 days – U.S. Immigration and Customs Enforcement released 9,200 migrant parents and their children to community groups in Arizona, mainly in Phoenix and Tucson, according to figures provided Wednesday by the agency. That is about 271 migrant family members released per day. In early October, ICE began to partner with charities and faith groups in Arizona to coordinate the drop-off of large groups of migrant families at locations where volunteers help them make travel plans to meet their relatives elsewhere in the country. The families have usually spent several days in U.S. Customs and Border Protection facilities before they’re transferred to ICE. ICE then processes the families and assigns them a follow-up interview before releasing them. The families, who are mostly from Guatemala, Honduras and El Salvador, come to the U.S. to seek protections and have either showed up at official ports of entry or illegally crossed the border. They are mothers and fathers who come with babies, small children and teens. Some interviewed by Arizona Mirror describe fleeing threats by gangs, and lack of opportunities to build a life in their home countries. In Arizona, most of the families are coming through the Yuma area, CBP figures show. Figures for how many families were released to community groups before Dec. 21, 2018 were unavailable, ICE said. ICE said the uptick in families arriving to U.S. border with Mexico coupled with court-mandated limits to how long it can hold minors in its custody prompted it to arrange the releases with charity groups. Separately, U.S. Border Patrol began directly releasing migrant families in Yuma about two weeks ago. Border Patrol spokesman Jose Garibay said the agency won’t share figures on how many people it has released in Yuma. Border Patrol agents have also done these direct releases in Tucson. In one sense the “partnership” between the government and the Faith/Non-profit Communities is a rather remarkable example of people coming together to help people. That the government agencies are overwhelmed is not a surprise. That good people are willing to step up to help is also not a surprise. Historically, the United States has dealt with mass migrations in different ways at different times. In this case, while we were talking about the Syrian Refugee Crisis and Climate Change refugees and border issues like trafficking and drugs, we weren’t looking to our Southern friends and the crises that were emerging in those countries. That some want to lump these things all together and paint this as a calculated flood of criminals to our border is also not surprising, but sad. To suggest that Americans cannot rise to the occasion to help people in times of need is also sad. I hope that the AZMirror and other news outlets can help us sort out the immigration issues which bring people to our borders — they are not all the same and do not all demand the same kind of response. For these asylum seekers at this time under these circumstances, I think what the people who work for ICE are doing and what people in Faith Communities and NGOs are doing shows the American spirit. I wish I could say the same for our government, our leadership, and our politicians.